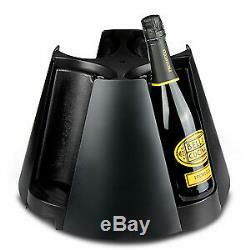 Made from durable acrylic, this Galaxy 4 Bottle Revolving Cooling Stand accommodates 4 x bottles of wine or champagne. Features 4 removable ice packs hidden behind each bottle holder. With a rotating axis, this wine holder revolves to display all varieties to your guests. Dimensions: H 270mm Ø 400mm Product Features. Rotating wine bottle holder & cooler. Revolves on an axis to display all drinks on offer. Suitable for holding 4 x standard 75cl bottles of wine or champagne. Features 4 removable ice packs hidden behind each bottle holder - for ultra chilled presentation. Perfect for dinner parties or events. For example - if you place an order over the weekend, it will not be processed until Monday. The item "Galaxy 4 Bottle Revolving Cooling Stand Wine Cooler" is in sale since Friday, March 31, 2017. This item is in the category "Collectables\Breweriana\Ice Buckets & Coolers". The seller is "drinkstuff" and is located in Royston, SG8 6DN.